Dessa’s book My Own Devices has been towards the top of my list of books I have been most excited for this year. Dessa is best known as a rapper and a singer. Not only did she grow up in Minneapolis, she started her music career with Doomtree, a hip-hop collective based out of Minneapolis. 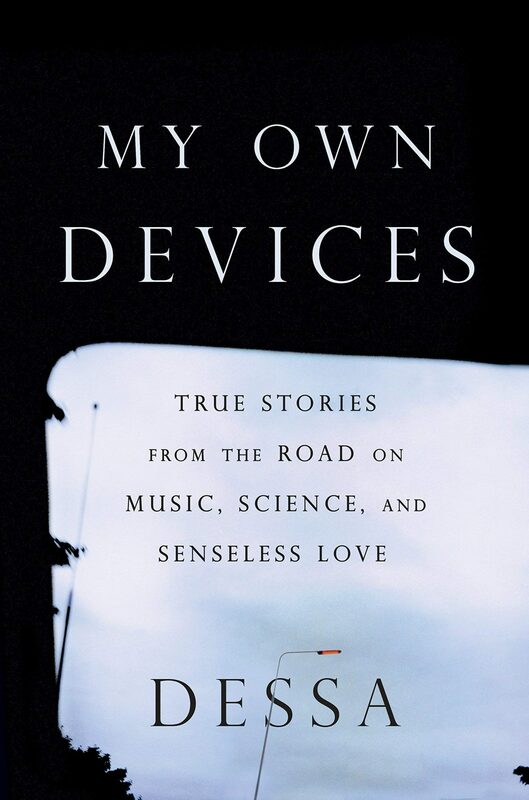 My Own Devices: True Stories from the Road on Music, Science, and Senseless Love is Dessa’s memoir. Stylistically, her memoir is compiled as a group of topical essays, where she shares her journey as a musician, the story of a romantic breakup, and her family life. Dessa is aware that she does not fit the stereotypical image of a rapper, as she divulges that “I’m socially polished and well educated.” She shares that “I talk like an academic and am asked to deliver paying speeches because of it.” In fact, before she was a rapper, she worked as a medical technical writer, confessing that she’d “been into biological science since I was a kid; learning about the fundamental nature of things seemed more interesting.” This enthusiasm that she has about science brings an inquisitive twist to the tone of her memoir. This love for the study of sciences takes a humorous turn in “Call off Your Ghost,” as she writes about designing “a scientific protocol to fall out of love.” She describes this effort as “part science project, part art project, and part earnest attempt to solve a real-world problem. I’d been in love with the same man for a very long time. He had feelings too, but we’d made each other thoroughly unhappy.” This ex-boyfriend gave her a lot of heartache. She pours out her experience with heartache in “The Fool That Bets Against Me.” In this particular essay, she describes her experience of writing to Geico to expand her insurance coverage to cover heartache, providing the argument that, “I am a song writer who makes her living writing torch songs. I’m able to do that well because I’m naturally melancholic and also because of unresolved feelings for a former romantic partner. If I were to find myself in a state of unchecked, protracted joy, I’d either have to re-career or take a lengthy sabbatical to acquire the skill set necessary for a new mode of self-expression.” These word choices were not only entertaining to read, but also provided a very well-thought-out argument. Even if there were not any insurance products that met her needs, I am quite sure that this gave her Geico representative a chuckle. She also brings a very honest perspective to life on the road as a musician. In “The Fool That Bets Against Me,” she describes being freaked out by someone trying to sell her disability insurance. She wondered: “What would I do if I busted my leg or got a vocal node or caught pneumonia and had to cancel a whole tour?” This brings an insight to the type of things that she worries about on a regular basis. She also shares how the life as a performer puts a strain on attempts at romantic relationships. She mentions that she dated a really nice man for a few years, and what ultimately broke them up is that she wanted to tour Asia, while he wanted to settle down and get a house and start a family. In addition to bringing honesty to the pain of her chosen path, she also shares her great joys. “Congratulations” chronicles her journey of working with Lin-Manuel Miranda on The Hamilton Mixtape. Dessa brought light to her giddy mood about this opportunity, sharing that after recording she “gave in to the self-obsessed, Gollum-y behaviors that musicians don’t like to admit to.” While this is humorous, the reality is bittersweet as she shares her disappointment that this experience “didn’t bring as much traffic to my music as I’d hoped.” But she found a silver lining in the cloud, as she realized “the song did give me a calling card I could use in New York. With the mixtape on my resume, every professional introduction got easier.” The temptation would be strong to play up the positive angle of how exciting it was to be able to do that kind of work and to gloss over the reality that it did not bring more attention to her own work. I appreciate how she brought emotional honesty to the reality of the situation. For someone who lives in the Twin Cities, there is also the added layer of not only knowing about the places that she mentions in the book, but also having been to many of the places she writes about. Dessa shares that she “quilted at the Minnesota State Fair and knew most Amish designs by name. There is more than one picture of me in a bonnet.” She had a job interview at Egg and I, she gave a presentation at Mayo Clinic, and when she traded notes on clubs with another musician, he mentioned that he liked the Dakota in Minneapolis. Personally, I feel like I have an added layer of understanding to a book when I have been to a place that is mentioned, and other Minneapolis/St. Paul readers may feel the same level of connection to the book with the places that invoke a level of familiarity. I would highly recommend this book. I made every effort to make sure that I was reading with a critic’s eye and not just as a fan of Dessa’s work as a musician, but she made my job difficult, because I found the book flawless. This is one of the most extraordinary memoirs I’ve ever read. The intellect and humor make the book both insightful and entertaining, and her emotional honesty about her hardships makes her narrative accessible. Whether you find yourself reading as a fan of her music or out of wanting an entertaining memoir you will find this an enjoyable, worthwhile book.